The news landed like a meteor in the blogosphere: Shaun White is "exhausted" and will not compete at the U.S. Open snowboarding championships where he was scheduled to compete in the men's halfpipe at the end of March. Exhausted he should be: after securing his second Olympic gold medal last February 2010, Shaun White made global headlines when he landed the highly anticipated Double Mc Twist (540x2) during his final run and in the weeks after that, he left snowboarding for a demanding schedule and an international tour flying to England, Japan, Germany, and the U.S. (Chicago and Los Angeles twice). As recently as 2007, Shawn White dominated the competitive vertical skateboarding by winning gold at the X Games and the Dew Tour series. But, after working hard to unsuccessfully demonstrate the same consistency in skateboarding that he has in snowboarding, White skipped last year’s violent skateboard season to recover from an ankle injury and focus on snowboarding to prepare for the Olympics. He now says that he is looking forward to returning to his original vertical skateboarding discipline ASAP. And that’s his best kept secret: because he is very strategic in his thinking, he uses skateboarding to cross-train snowboarding and vice-versa like a “master plan”. “I’ve done some things on snow that have really opened my eyes, where I think you could start flipping certain tricks in skating,” he said. “And it’s the best feeling because I’m excited to go do it”. This is one thing among others that he shares with Lyn-Z Hawkins, another skateboarder pro that uses surfing and snowboarding to cross-train complex aerials. 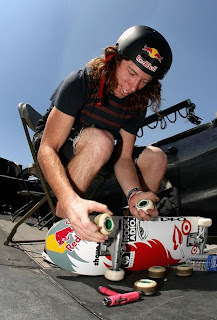 After winning his first Olympic gold medal in the halfpipe at the 2006 Olympics in Turin, Italy, Shawn White was expected to dominate skateboarding and land the first 1080, a three rotation spin, but the spin never materialized and he finished last in the 2006 Dew Tour. The same year, he got the same problem at the X Games and he finished eighth in vert. He did not land any maneuver in the vert best trick event, which he dedicated to try to performing a 1080. Disappointed and angry about his showing, he is now monitoring his skateboarding progresses before he confirms to competing on the Dew Tour, which begins June 25 in Boston (The Skate Open ISF Skateboarding World Championships starts June 25-26 in Boston, Mass. At the TD Garden). On top of the Dew Tour, he said he had targeted at least two more skateboarding competitions this summer: the X Games in July, and the Maloof Money Cup in August, this year held both in the OC and New York. Mike McGill who is simply the inventor of the eponymous Mc Twist recently said “It definitely feels good when somebody like Shaun White gives you props for your trick.” The first Mc Twist was landed at a Swedish summer camp around 1983. “I made the trick and I still couldn’t believe how I was going to do two (spins) because you are going blind twice.” In 1983 the Bones Brigade (Tony Hawk, Lance Mountain, Steve Caballero, Mike McGill, Rodney Mullen and Per Welinder) were traveling though Europe and they stopped in Sweden for a skate camp. At the camp McGill was watching a demo from Fred Blood, an aggressive roller skater. On a backside air Fred managed to twist himself and sort-of spin sort-of flip a 540-degree revolution above the coping. Mike studied the position of Fred's feet and the way he shifted his weight, rotated his shoulder, tucked in and made the spin/flip complete. The 360 had already been done on a skateboard. The frontside 540 was already possible but just below the coping of a ramp or bowl. Mike wanted to spin backside and above the coping of the ramp in the way Fred Blood had, so he practiced that summer and threw down a backside 540 or "McTwist" in the Del Mar Skate Ranch competition. Rodney Mullen immediately named the trick Mc Twist. 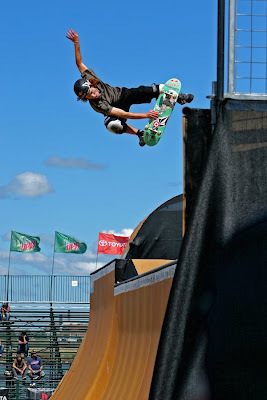 That year, McGill ushered in a new aerial dimension to vert skating by adding an inverted twist to the maneuver and successfully performed his signature move at the Del Mar contest. Now that Shawn White has landed the Double McTwist on a snowboard, the question of whether the trick is possible by skateboarders on the MegaRamp is open. MegaRamps are huge wooden structures that consist of a roll-in, a gap jump and a quarter pipe and that are used in Big Air events around the world. 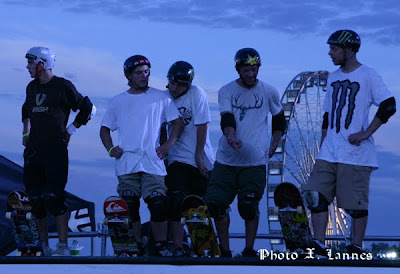 The large-format ramp enables skateboarders to reach higher speeds and amplitude closer to what snowboarders are able to achieve on a snow halfpipe compared to a traditional skateboard vert ramp. X Games gold medal winner Jake Brown is no stranger to this increased amplitude. In the 2007 X Games, Brown fell 40 feet after he miscalculated a McTwist on his takeoff from the quarterpipe of the MegaRamp. Two years later, the Oceanside-based skater returned to claim gold after airing a 20-foot-high McTwist above the quarterpipe. Already, officially at least 5 people landed the 900 in a ramp, only half a rotation is missing to land the 1080. The limited club also includes Tas Pappas, Danny Way, Giorgio, Rob "Sluggo" Boyce, Jake Brown and Richard Lopez all of them “sort-of” almost landed it. We are very close to the 1080, but not there yet. Therefore, will the 1080 be landed this summer? And who will be the first to land it? Without any doubt, 2010 will be a thrilling and exciting summer for vert skateboarding!